NOWHERE LAND, Seattle, Sunday (NNGadget) — Microsoft today implemented its 100% Data Confidentiality package for T-Mobile Sidekick, comprehensively protecting users’ contacts, email and messages from any possible attacker. 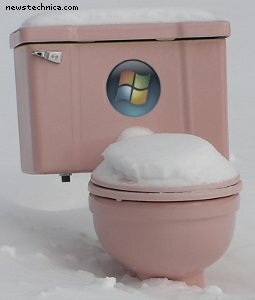 Microsoft plans to leverage the new confidentiality mechanism to finally purge the horror of Vista from the face of the earth, in the same manner as firing all the contractors who knew how to build Windows 2000 and having to reconstruct Windows XP from bits of NT 4. Microsoft Sharepoint users looked forward to a similar denouement as the only safe way to scour their hopelessly incompetent organisations from the world in a manner that would not infect successor organisations. Microsoft is putting together an outsourcing proposal to the UK government for data protection. Can I buy one of those Windows toilets from Argos or somewhere?